1. Emily Humphrey Tonal Character Polka Print Cushion £72.00 [x] : This cushion is definitely on the pricier side but I love the playfulness of the design. It's also double sided with a black and white floral print, with animals poking out from behind on the back. This would definitely be in my dream home. 2. JIMBOB Art Miss Panda Coffee Cup Set £45.00 [x] : These four cups stack up to make an adorable panda, perfect if you want a little bit of quirky art in your kitchen that has a use at the same time. 3. Alessi Alessandro M. Corkscrew £26.00 [x] : This corkscrew just puts a smile on my face, this little chap just looks so happy. 4. Heat Up Huggable Bambi £10.00 (was £15.00) [x] : As the cold weather gets worse and worse, I'm constantly wanting to keep warm and snug and I think this heat up huggable Bambi is perfect for that (and luckily it's in sale too!). 5. Vintage Photo Frame £30.00 (was £50.00) [x] : This vintage style photo frame allows you to hang up your pictures, and is a perfect little addition to any room of your home. 6. Hedgehog Cheese Grater £9.99 [x] : Available in several colours, this hedgehog cheese grater is a quirky and fun addition to any kitchen. Thank you for reading lovelies! Hope you have an amazing day and remember to comment below. Great, never seen a post like this it 's absolutely fab! I love it! Those Panda cups are the cutest thing I ever did see! I definitely need them when I'm adult enough to have my own house! Great blog post!! I love these types of posts as a lot of my friends birthdays are soon so I take inspiration from these types of posts. I absolutely love the pillow! Please checkout my blog if you haven't already any comments you may have and a follow would be amazing! As per usual a lovely selection of items. My favourites are number 2 and number 5. The cups would look so cute with a lady bird themed plate and saucers etc. :) I would love something like the vintage photo frame in my room. Love them! Glad you liked them and I'll go check it out :) ! Haha it takes A LOT of searching but I think it's worth it :) Glad you love it! That panda mug set is the cutest thing ever! 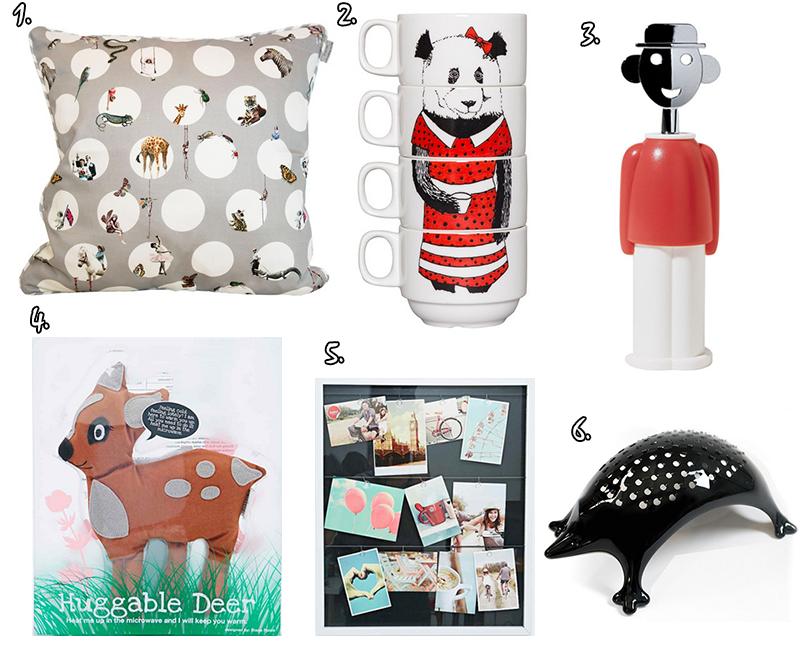 I'm such a lover of homewares, following girl! Lovely gifts, espeially the heat up huggable Bambi! Thanks x :) Me too! The cushion is gorgeous. Really pretty pattern, if a little pricey!